Renu IQ es un suplemento bebida antiedad de gran alcance diseñado para proteger , mejorar, re- equilibrio, recuperar energías y normalizar la función cerebral. Renu IQ es una mezcla de los adaptógenos artesanales salvajes , vitaminas claves y el resveratrol superestrella antienvejecimiento. Tiene una deliciosamente refrescante sabor de uva natural. Formulated by a Harvard MD and specialist in anti-aging medicine, Renu IQ is a powerful anti-aging designed to protect, improve, re-balance, re-energize and normalize brain function. 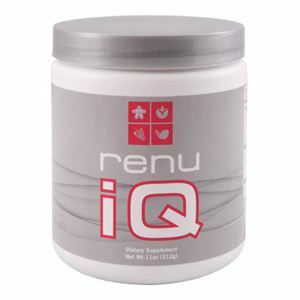 Renu IQ is a mixture of wild craft adaptogens, key vitamins and anti-aging superstar resveratrol. It has a deliciously refreshing taste of natural grape. Renu IQ drinking 1-2 times a day, you will give your powerful brain anti-aging substance that can help you become smarter, sharper, more alert and focused. They will also be supporting his brain in their fight against oxidative stress and inflammation.